It’s only been one day, but the tone of interviews have been decidedly much more interesting this week. My first interview this morning was for an interim organization. I ended up taking 1 hour and a half of exams (… and here I thought I would be done with exams once I graduated from university XD). They were very difficult too! The interim org. tested my Microsoft Word, Powerpoint and Excel skills. The lady who interviewed me warned me that they would be very challenging but not to worry. Apparently they don’t expect anyone to do very well on these. They just use them to get a feel of candidates’ abilities. Thankfully, the French and English exams weren’t too stressful. The lady called me back later to tell me I did well enough on the exams and that she had a potential employer for me. The company in question is situated on the Champs-Élysées (read: veeeeeeery nice part of Paris), does business consulting, and needs someone to act as an administrative assistant to 12 junior consultants. Turns out they recently stopped looking since they had not found an appropriate candidate, but the lady who interviewed me thought they would be interested in me. I stopped at a small café to grab lunch with an American friend (those tests made me ravenous!) in between my interviews. Funny enough, I met her through my dad. Her dad is the owner of the store my dad bought his motorcycle from. 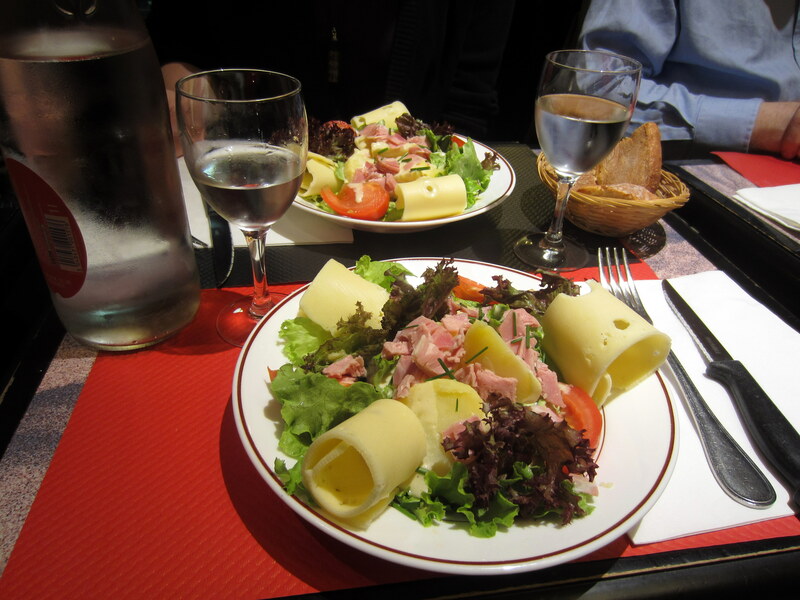 They ended up chatting about their kids and were surprised to realize that both of their daughters were not only in France, but in Paris… a few emails later and we’re having lunch near the Rue du Bac métro station. Yes, those ARE potatoes and Emmental cheese you see in our salads! My 2nd interview was for Contract Live, a start-up that offers mid-size and larger companies contract management software. At first though, the idea doesn’t sound super exciting, but the team is great! After chatting with them today I feel like I would truly enjoy working with them. They are very open-minded and open to taking risks in communications and e-marketing, an absolutely dream come true for a comm. person (usually companies are afraid to take risks to stand out and would rather stick to more traditional, less productive means of PR/e-marketing.) Their vision of what they want comm. to be for their start-up would enable me to take risks, develop my skills and have something impressive to show for all my work once Contract Live becomes more well-known amongst businesses. They would pay me a little less, but this opportunity would be much more fulfilling on a personal level as well as much better for my professional development. I’m supposed to hear back from then soon regarding whether I got hired so stay tuned!